What Makes Dinosaur Escape Special? Here at Dinosaur Escape from the moment you walk through the front doors, we take you on an adventure with some of the most dangerous animals that have EVER walked our earth. You’ll be teleported right back to the Jurassic Era as you get to navigate the course while enjoying 18 holes of adventure golf. That’s right we don’t need many other reasons as to why Dinosaur Escape is the perfect activity no matter who you decide to play against – from friends to family…who wouldn’t want to meet our friendly dino’s ?! The perfect activity would be one that includes fun, laughter, competition and is suitable for all ages and just your luck, we cater to all of these things! Whether you wish to play with your family, friends, your partner or whether you visit for a team building activity, Dinosaur Escape is the venue in which you can let your hair down and guarantee laughter from everyone. Not only do you get to meet the dino’s but we transport you back 65 million years where you can really experience a prehistoric world. Our range of vegetation from plants to trees really does build the atmosphere not to mention the constant roaring from our hungry dino’s. Dinosaur Escape boasts 18 holes of adventure that does not only test your putting ability but your competitive streak as well. There are dinosaur teeth, waterfalls, rocks and lots more to avoid and put through to test your skills. 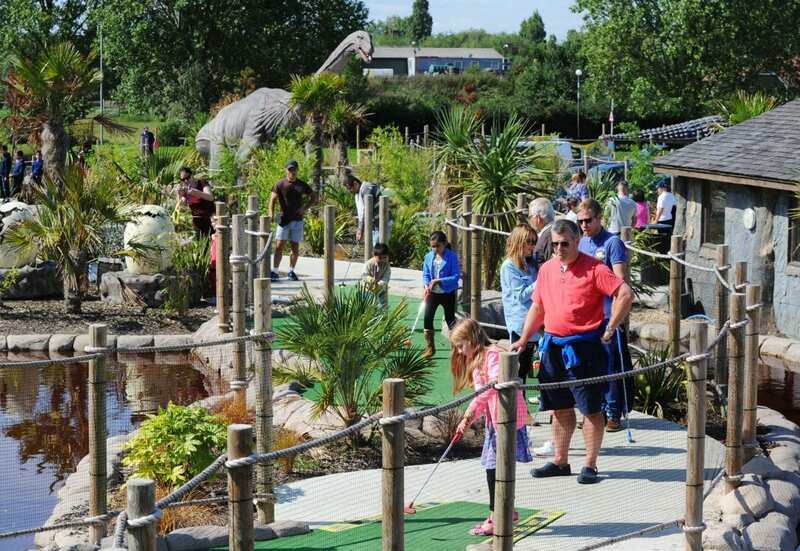 At Dinosaur Escape, we have your favourite colour balls to choose from that come with an ounce of luck (the rest of the game is down to the player), we have putters suited to all age groups from toddlers to adults and some lucky players may even receive a medal for a hole in one! Our staff will happily deal with your questions and requests to ensure that your visit to Dinosaur Escape is one never to forget- even if you do lose. We have seen it all, from family arguments (just like the monopoly ones), to couples almost breaking up due to all the cheating around the course but we love being here to witness it all. If you are looking for a fun activity that suits everybody then look no further!